Like many women of my generation, I was introduced to the fabric arts at the earliest opportunity, at my mother’s knee with a needle and thread. This was the start of a long creative journey that led to a full time career in art textiles. 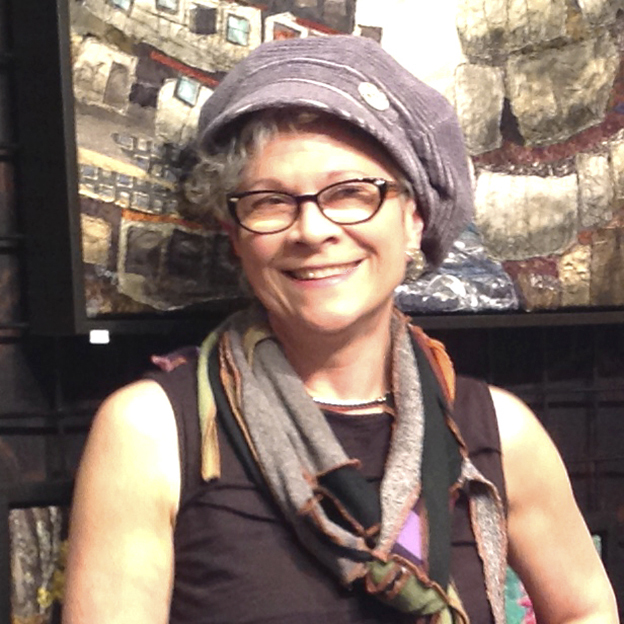 I have been working as a professional artist in the textile medium since the mid 1980's. For my formal education, I earned a BSc in Agriculture, Majoring in Ornamental Horticulture, and have been studying developments in tree research since graduating in 1978. In my work I draw upon my background in science to create images in fabric which evoke the strong connection I feel with the natural world. Most of my wall pieces are inspired by the biology, mythology and symbolism of trees, classic emblems of the communion of earth and spirit. With my sewing machine, I use distinctive raw edge appliqué techniques and an evolving visual vocabulary to interpret and illustrate living organisms and biological systems. Since fabric is itself a plant or animal product, it is an ideal material for expressing and capturing the attributes of natural forms, and the techniques I use mirror processes that bring order to diverse and humble materials. On our half acre of property on the Niagara escarpment, my husband, fine art photographer Janusz Wrobel and I built a self standing studio and gallery surrounded by gardens. We participate in local open studio events, and visitors are also welcome by appointment. You can also see my work at any of my representing galleries. My Facebook Page is the best way to keep up with all the latest news. For more information about the historic Dundas Valley with its charming shops and restaurants and its extensive nature trail system, click HERE.